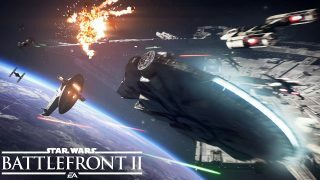 Two teams compete in epic, multi-stage battles between swift starfighters, powerful hero ships, and huge capital ships in objective-based dogfights. A docked Imperial Star Destroyer is a perfect target, but her shields are still operative and she's protected by the Empire's most elite fighter pilots. Can the Rebel Alliance penetrate the defenses and bring her down? Earn Battle Points in combat and take control of the most famous ships in the galaxy: Han's Millennium Falcon, Boba Fett's Slave I, Darth Maul's Scimitar, Poe Dameron's Black One, and many more. Then use Star Cards to tweak them to your play style. Fly three distinct classes of starfighter: speedy interceptors like the A-wing, powerful fighters like the TIE/ln, and deadly bombers like the Y-wing. Every starfighter is customizable with Star Cards. Alliance X-wings, Y-wings, and A-wings attack an Imperial installation protected by TIE Interceptors, TIE/ln fighters, and TIE Bombers. Can the Rebellion take down the docked Star Destroyer in time?